The trust was offered another former pulling lifeboat up in Northumberland. The lifeboat Edward& Eliza was however in a very sorry state and well beyond any restoration, it was hoped though that the lifeboat could serve as a tender for spares for the William Riley. The ex - lifeboat had broken down at sea and was herself rescued by a lifeboat. Once brought ashore she was left on a bank side, but left unattended the boat the boat filled with water, the sides of the lifeboat could no longer hold the weight and she literally tore herself in two. The lifeboat was quite a lifeboat and was even awarded a Silver Medal for one of her rescues. Up in Northumberland the boat was prepared with what water could be, drained away. Thankfully there was a small engineering unit close at hand who were willing to lift the lifeboat onto a suitable trailer. Once more Jeff Robinson Transport, stepped into the breach offering to transport the former lifeboat down to Whitby for the trust and once there transfer the William Riley into her new base. John Morley offered his assistance lifting the Edward & Eliza down from the trailer. The boat was eventually salvaged for what could be recovered and it was a rather sad time to see a medal winning lifeboat reduced to just a pile of timber. I have added a page with more information about the Edward & Eliza which marks a sad end to the boat. Whilst all this was happening it was also deemed prudent to begin preparing the new restoration base for the arrival of the William Riley. 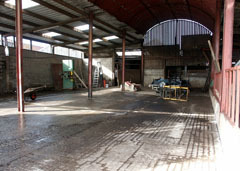 The first step was to give the barn a thorough cleaning and Tim was on hand as ever to use the jet washer, he found it necessary to clean it a number of times to get it to a stage suitable for the lifeboat. The doorway was measured again as the lifeboat was brought round to the barn, even though the lifeboat had been lowered on the trailer prior to the move it was still too high to go under the door frame, thankfully John was happy to burn some of the barn sheeting. After some persuasion the lifeboat was coaxed into the new restoration base and it only needed some small manoeuvring with John's forklift to get it into a better position. The trust was always concerned about making the lifeboat easy for volunteers to work on whilst making sure that it was safe and accessible. One way of meeting these aims was to surround the entire boat in scaffolding, which could be set at a height that would allow easy access for to work on the lifeboat without balancing on ladders, the proposed scaffold would also double as a temporary work station. Another trustee managed to beg the loan of a substantial quantity of scaffolding. Late one teatime on a dark winter night Tim Hicking and Mike Davis set about erecting the scaffolding. I went along to record the event and happened to consider the available light, thinking it would have been dark I took my video lamp with me. It is a powerful 1000 watt lamp and even with this set up on high power the light was still restrictive. Thankfully Mike, was professional enough to guide Tim and in one evening they had just about completed one side. 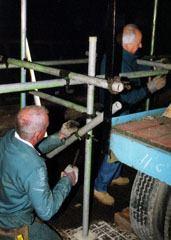 The following evening Mike and Tim went back to the barn, this time however I was not able to make it, yet they still managed to finish the remaining scaffolding including handrails and a set of steps. The trust also secured a large quantity of rubber non slip matting from builders dismantling the old lifeboat station as well as some of the wooden beams from the roofing structure. It is quite nostalgic knowing that in time, wood saved from the rebuilding of the old lifeboat station (built in 1919) will make its way into the restoration of the William Riley. The wooden beams are destined to be the replacement oars the lifeboat is going to need. The trust was hoping to gain sponsorship from local businesses, who might consider sponsoring an oar, the trust would have marked the sponsored oar with the business name, but the scheme was not very successful.